A series of terror attacks hit Brussels on March 22. Two blasts rocked the departure hall of Brussels’ Zaventem Airport at about 8am local time reportedly killing at least 13 people, injuring 35. According to Belgian broadcaster VRT, a suicide bomber was responsible for one of the blasts. Three suicide belts packed with explosives have been also found at the Brussels airport by police. A gunfire and Arabic shouts have been reported before explosions. A blast at the Maalbeek metro station followed the explosions in airport killing 10 and injuring 15 more. The Maalbeek station is located near a number of important EU buildings such as Berlaymont building, which houses the EU Commission and the Council of the European Union. Minutes after the blast at Maalbeek, explosions were reported to have taken place at Schuman and Arts-loi metro stations. The security alert has been raised to the top — fourth — level throughout the country following the blasts. 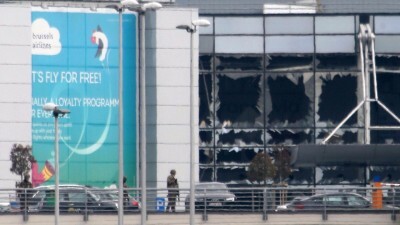 Public transport and airport in Brussels has been shot down. The French-Belgian border has also been closed, control has been increased at nuclear sites. These events comes just four days after the capture of Salah Abdeslami n a police riot for playing a key role in the Paris attacks in November. On Monday, Belgian’s Foreign Minister, Didier Reynders, announced on a security forum that Abdeslami thought to have plotted more future attacks on Belgian soil. The official revealed that Abdeslami is linked with a wide terror network in Brussel. The Belgian authorities have found more than 30 people involved in the terrorist attacks in Paris, where 130 people were killed. However, the obtained information hasn’t allowed the authorities to prevent attacks which highlight the willingness and capability of militants to conduct terror attacks in the EU. We remember much of the planning for the November attacks in Paris was also conducted in Belgium. A terror threat has become especially high in Europe because high number of terrorist arrived in the EU with refugees.